In this first blog post in our sales apprenticeship series we thought we’d bust a few myths. 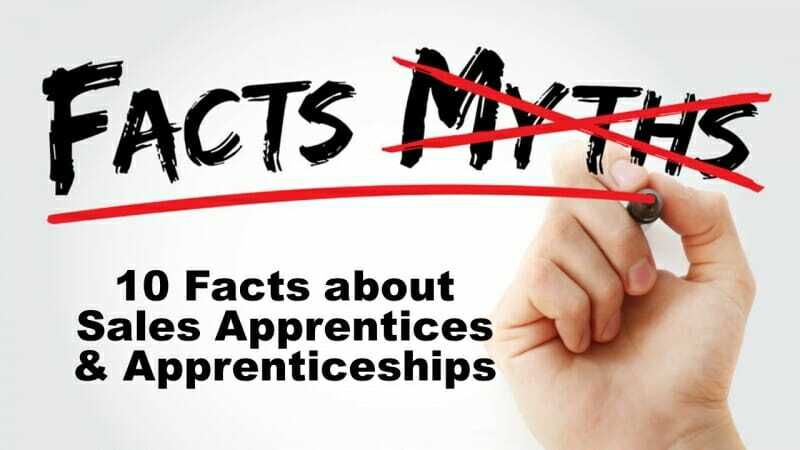 So here are ten facts about apprentices and apprenticeships you might not know! 1) Apprentices must be employed in a real job, but they may be a new hire or an existing employee. 2) Apprenticeships are not just for low skilled workers. For example, a level-4 apprenticeship (such as the Sales Executive Apprenticeship) will challenge apprentices to develop their knowledge and skills to the same standards demanded of a first-year university degree student, with level-5 apprenticeships on par with year-2, and level-6 apprenticeships (such as the Business to Business Sales Professional (Degree) Apprenticeship) on par with the final year. 3) Many apprentices deliberately chose apprenticeships over more traditional types of learning, even at higher levels. Apprenticeships blend off-the-job learning (in many different forms) with on-the-job experience, giving apprentices the opportunity to immediately apply what they’ve learned within the real world. For many this makes apprenticeship learning more relevant, more engaging, more accessible and more fun when compared to other forms of ‘traditional’ education or training. 4) Many employers also prefer apprenticeship programmes over more traditional types of training too. The continual mix of off-the-job training with on-the-job application means that employers typically see improvements in the apprentice’s work almost immediately, making the return on training investment very rapid indeed. (There are also advantages when it comes to funding too, which we’ll cover in our next blog post on how sales apprenticeship training is funded). 5) Many apprenticeships are open to everyone regardless of their existing level of qualification. As long as you can demonstrate that a gap exists between the person’s current level of competency (their knowledge, skills and behaviours), and that which is required to pass the apprenticeship, then they’ll usually be eligible (subject to factors such as their right to work in the UK, etc). Where pre-qualification requirements do exist, in many cases prior experience may be considered as an alternative. 6) Apprenticeship training must be of high quality. Unlike private training providers, apprenticeship training providers are regularly monitored and inspected by Ofsted to ensure this is the case. 7) All apprentices work towards achieving an approved apprenticeship, as defined by either a ‘new’ apprenticeship standard (such as the level-4 “Sales Executive Apprenticeship” and the level-6 “Business to Business Sales Professional (Degree)” apprenticeship) or an ‘old’ apprenticeship framework (currently being phased out). 8) Under the new standards, apprenticeship programmes must last at least 12-months. This period is made up of a training phase (as defined by the apprenticeship standard) delivered by an approved apprenticeship training provider, and an end-point assessment phase (as defined by the apprenticeship assessment plan) delivered by an approved independent end-point assessment organisation. 9) During the training phase the apprentice must spend at least 20% of their time on ‘off-the-job’ training. Defining off-the-job training isn’t simple, but it can include training that takes place in the apprentice’s normal place of work, and in certain circumstances can also include training delivered by the apprentice’s employer. (For more details, the AELP has published some easy-to-follow guidance on off-the-job training, which is available on their website here). 10) Apprenticeship training doesn’t have to be day-release (flexible forms of eLearning and distance learning can be included too), but it must take place within the apprentice’s normal working hours. Where training takes place outside of these hours DfE (Department for Education) rules state this must be “by exception”, and that the employer must recognise this and support the apprentice through “time off in lieu or other arrangements”.